Even by 1985 after some eight years experience of regular rail travel in China, the thought of spending more than a few minutes in a hard class carriage was a daunting prospect. The journey to be undertaken had been done in reverse using soft class 4-berth compartments which were a comfortable way to travel but the frequency of the service and the demands of the itinerary were such that it was a case of 'biting the bullet' and travelling in hard class. 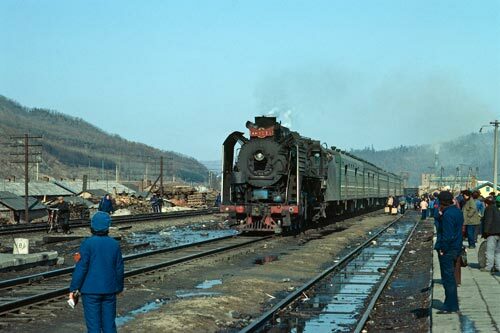 Photo - An RM class 4-6-2 arriving at Langxiang station. Despite it being March, there was still a bite to the air with local rivers still frozen solid and evidence of some snowfall over the surrounding hills. Even by 1985 there were many shortages of basic commodities in China and for most people this included fuel for heating. Despite its location, Langxiang did have the benefit of large supplies of scrap timber so heating was less of a problem than in some areas especially the larger cities. However having to stand outside even for 15 minutes was not a comfortable experience so everyone was jostling for position when the train drifted into the station. At the head of the train was RM class 4-6-2 no.1223 looking a bit worse for wear but still an impressive sight. Well maintained, if not clean, there was no evidence of leaking steam and, as was common throughout China, the fire was not oversupplied with coal hence the general lack of smoke. The delight at being hauled by steam was soon forgotten in the ensuing battle to join the train. Remember Chairman Mao had re-educated people and the population seemed to have lost any sense of politeness in the mad scramble to get a seat. A few minutes passed as the masses struggled through the doors. Instead of an orderly single file, six or eight people battled to get through the narrow doorways. Ah well, it was time to join in, using whatever you could to gain a superior position. Once on board it took a few minutes to get used to the gloom. The interior décor was dark and uninspiring with the small windows not helping with illumination. People seemed to be everywhere including the luggage racks and finding a place to park one's bottom was quite a challenge. Further problems to be overcome were firstly the thick clouds of tobacco smoke and secondly the overbearing heat. It soon became apparent that there was a third annoyance in the Chinese habit of spitting with the staccato sound of spit hitting floor resonating around the carriage. "Ah well not long to go" you kept telling yourself. Despite the privations everyone was friendly and wanted to see more of the European in their midst. Most people on the train had probably not seen anything like me before! Small boxes of rice together with tofu or some other form of protein was about the only food on offer. The choice of drinks was equally narrow with hot water the preferred tipple. Frequent station stops and the noise of steam trains passing the other way kept me busy. At Suihua, the RM class pacific was replaced by SL class 4-6-2 no. 719. These machines were originally the mainstay of the express passenger locos until the RM class were introduced in 1958. Both classes were capable machines although nether type were that powerful and acceleration was at best mediocre. Continuing south to Harbin, I had become used to 'ambience' of hard class and despite my initial concerns, I continued to use this form of travel in China a number of times when soft class was unavailable. Reaching the capital of Heilongjiang, the train emptied onto the platform in much the same manner as people had boarded. What people cannot understand that an orderly queue is likely to be easier than five bodies with assorted luggage attached fighting for space is beyond me. A little patience on my behalf meant an easier descent onto the platform and the cold night air of Harbin.